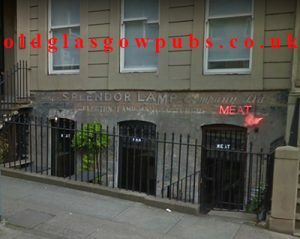 142 West Regent Street, Glasgow. G2 2RQ. 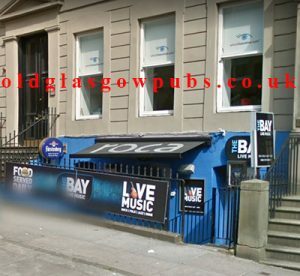 Tel: 0141 204 3605. Update…2005. Now Called the Bear. Mouth-Watering moussaka, burger on sesame bun with French fries, tagliatelle Bolognaise and quiche…, all at one restaurant. 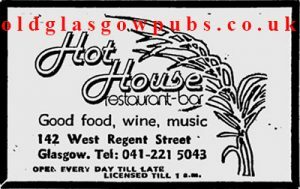 Versatility is the trademark of the newly opened Hot House Restaurant at 142 West Regent Street, Glasgow, and it’s a policy that should pay off for the enthusiastic young owners Maureen and Gregg McLeod. They wanted to create a decor, an atmosphere, and most of all a set of taste sensations that patrons would remember with affection, a place to go back to time and time again. I reckon they’ve succeeded. The initial impact is one of welcoming, spick and span sophistication. 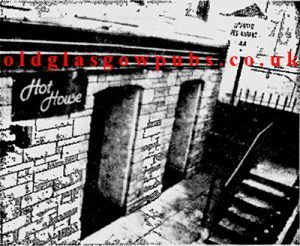 With its 1.0 a.m. licence, the Hot House will soon hold a warm spot in Glasgow’s heart. Advert for the Hot House 1979. Now known as “The Bay.” 2012. 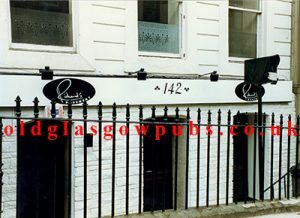 Do you know anything about this bar? If so please leave a comment.